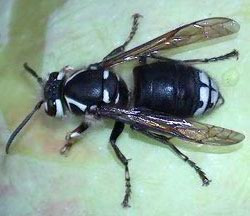 Wasp, Bee, and Hornet Removal/Control and Extermination in Minnesota and Wisconsin. Your local Bee, Wasp, and Hornet Removal and Extermination Experts. Superior customer service and competitive prices for Wasp, Hornet, and Bee control Minneapolis MN, St Paul MN, and Western WI. Stinging Insects: The Nations most dangerous Pest. "Let us take care of your Bee/Wasp Problems"
American Pest Solutions are experts in bee removal and extermination. We offer same day service for bee removal and extermination and quickly and effectively take care of your bee problems. Just mention code "bees be gone"
Call Now! and talk to one of our bee removal and extermination Experts, or to Schedule an appointment. Click on the link below and ask online questions about our bee and removal and extermination services. Your questions will be answered within one business day.